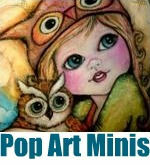 Pop Art Minis: My Sis Made This... It's sure to be the "Hit of the Party!" My Sis Made This... 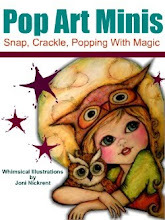 It's sure to be the "Hit of the Party!" I know I've bragged on my sister, Shari before because she's always coming up with some of the most creative and fun ideas, but GEE-raffe I couldn't resist sharing another one of her awesome creations! 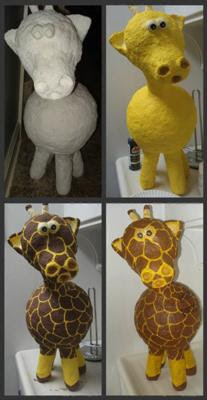 It's an adorable hand made Giraffe Pinata that she created for a safari themed birthday party! "I used two balloons - one for the head and one for the body. After I covered the balloons with paper mache, I waited until they dried and then I connected them with a paper-towel roll. I poked four holes in the body and inserted shorter paper-towel rolls for the legs. I reinforced everything with more paper mache. After everything was dry I painted and stained it. It was the "hit" of the party... haha"
Oh, Shari, by the way I'm hoping for a really fun pinata for my birthday coming up soon...hint! hint!